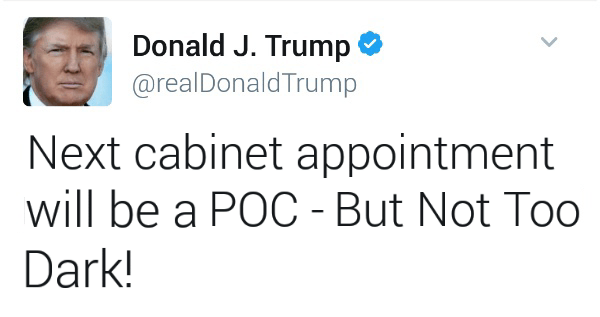 President-elect Donald Trump announced during an appearance on Fox And Friends this morning that his next cabinet appointment would be a person of color, before quickly adding “But not too dark!” while winking at co-hosts Brian Kilmeade and Steve Doocy. Trump’s cabinet picks so far have caused a fair bit of controversy. So far Alt-Right leader and alleged white nationalist Steve Bannon, and Jeff Sessions – a man once considered too racist for the Reagan administration – are getting the most criticism. Many see this morning’s announcement as nothing more than Trump’s attempt at damage control, a claim that the billionaire does not dispute. Trump went on to specify that he was looking for someone of “medium to light darkness…more Rashida Jones than Whoopi Goldberg” so as to keep the rest of his cabinet from feeling too threatened, or pasty. Trump went on to mention that Melania, who is re-decorating their apartment interior, listed the ideal color somewhere between “Desert Tan and Havana Cream” on the Pantone paint color chart. “Definitely nothing darker than Havana Cream,” he reiterated. When asked by the two hosts which cabinet position he was hoping to fill with a person of color, Trump first joked “Secretary Of Rap Music” before giving the more serious answer of Department of Housing and Urban Development. Trump ended the segment by assuring his loyal supporters that despite his decision to hire a person of color, he is still the candidate that they voted for.